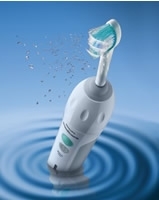 All of our electric brushes offer professional standards of care and good value. We recommend that on all of them the brush heads are changed every eight weeks, except the Sonicare which the manufacturers recommend should be changed every six months. Toothbrush Direct are pleased to offer our customers free recycling on a like-for-like basis - so when you buy a new item from us, we can make sure your old model is taken care of. If you wish to use this optional service, it only requires you to return your like for like item by post to us referencing your order. Unwanted electrical equipment is the UKs fastest growing type of waste, and sending it to landfill causes lead and other toxins can leak out and cause soil and water contamination, harming wildlife and human health. We just want to help as many electrical items can now be repaired or recycled.